Indonesian Grilled Fish or Ikan Bakar Indonesia. Sounds mouthwatering right? I know. Especially if you are spicy food lover like me and if you love all those traditional Indonesian tastes, including sourness from lime juice and saltiness from tauchu/fermented soy beans and terasi/belacan. 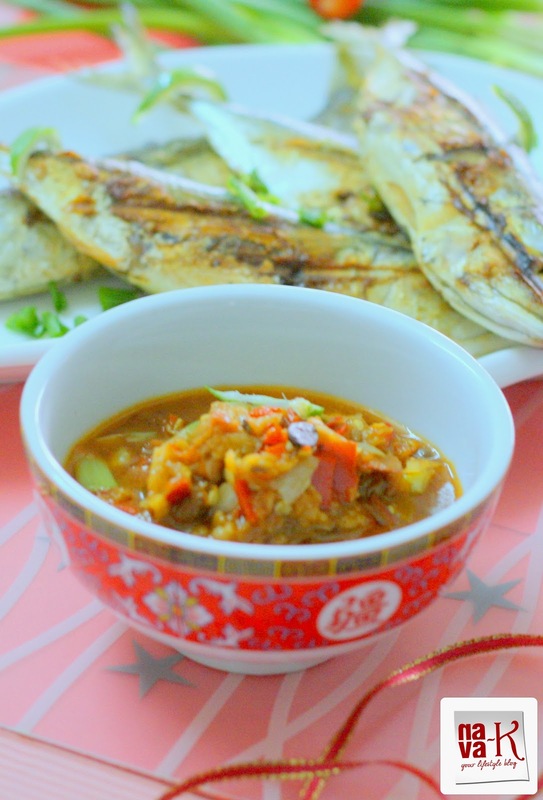 Remember, can you still recall (Sambal Goreng Teri, Sambal Terasi & Ikan Belado? Plus, how can forget the rest of our Malaysian dishes? Cooked alongside almost similar ingredients and akin a spicy pop in our mouth (Malaysian Fish Sambal, Ikan Masak Kicap & Stingray Spicy Sauce). 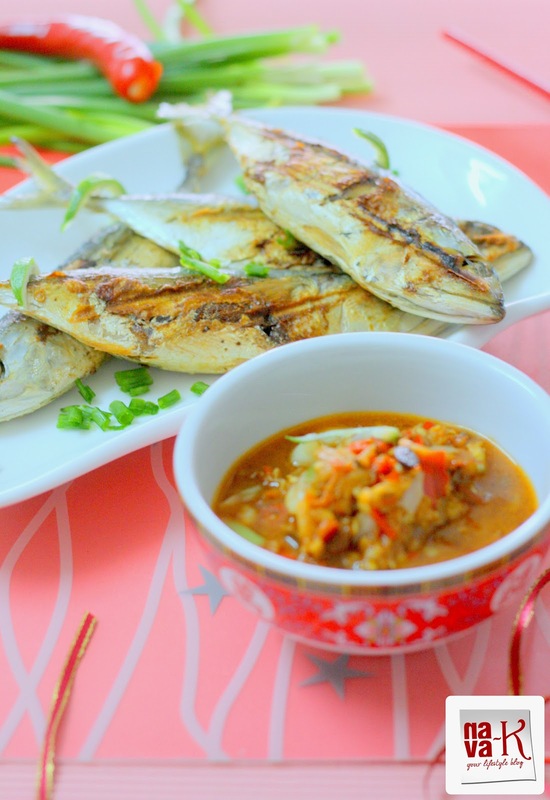 Also, maybe I should mention other fish recipes from our Asian continent which showcases spiciness, sourness and saltiness (Thai Crispy Fish, Hong Kong Steamed Fish, Cambodian Fish Soup & Vietnamese Fish Soup) too. Generally, as far as I know and as far as I have seen on cooking programs, quite a fair bit of ingredients are marinated or mixed alongside Indonesian Grilled Fish prior to grilling. But for my version, I kept it simple for grilling (Grilled Salmon), yet, when grilled fish is dipped into the accompanied Indonesian style sambal I made, trust me, nothing is compromised because its still a major revelation of the much loved boldness (Spicy Grilled Fish, Grilled Fish In Banana Leaf & Grilled Fish Sambal Stuffed). 4 pieces of ikan kembung/fish - wash, pat dry and rub tad bit of salt all over. Pour a bit of oil in a heated portable grill. . Grill fish on both sides till cooked - light brown yet still tender and moist. Mix the ingredients for the dip and serve together. I am going to try that dip as dressing for my salad. looks yum. BTW that yogurt soup was yum. wow! nice pictures and recipes. Thank you for stopping by my blog. Look forward to follow you. It's always painful to hear of these disasters. I'm also following the news closely, wishing for the best. This looks like a Teochew dish with the taucheo. I'm a Teochew & my dad used to eat fish this style. Taucheo dip sounds very yummy. Hi Nava, your this grilled fish and taucheo dipping sauce look so appetizing. I sure need 2 bowls of rice. Really good, 2 thumbs up for you. I usually shallow fry fish, Not yet tried griled fish. Fish looks delicious....can't say much I am a vegetarian after all..
Hope god answers everybody's prays and plan is found..
Me encanta el pescado se ve delicioso,abrazos. Something as large as a plane could go missing really hard to believe. The grilled fish and the dip looks awesome. It feels sad and painful what those families are going through . A very new dish ! but looks so yum and tempting ! Good recipe, wonderful pictorial presentation! Looks delicious ! I love it ! The recipe and the riot of colors look great.. I am checking the news several times for an update..high time the plane is located! Omg amazing cook a plate and yes I will take the glass of wine.